Insect pest control continues to be a challenge for agricultural producers and researchers. Insect resistance to commonly used pesticides and the removal of toxic pesticides from the market have taken their toll on the ability of agricultural producers to produce high quality, pest-free crops within economical means. In addition to this, they must not endanger their workers or the environment. We depend on agriculture for food, feed, and fiber, making it an essential part of our economy. Many people take agriculture for granted while voicing concern over adverse effects of agricultural production practices on the environment. Insect Pest Management presents a balanced overview of environmentally safe and ecologically sound practices for managing insects. This book covers specific ecological measures, environmentally acceptable physical control measures, use of chemical pesticides, and a detailed account of agronomic and other cultural practices. It also includes a chapter on state-of-the-art integrated pest management based, a section on biological control, and lastly a section devoted to legal and legislative issues. Insect Pest Management approaches its subject in a systematic and comprehensive manner. It serves as a useful resource for professionals in the fields of entomology, agronomy, horticulture, ecology, and environmental sciences, as well as to agricultural producers, industrial chemists, and people concerned with regulatory and legislative issues. This book should be in major reference collections and on the shelves of pest management specialists and their coworkers. 5. 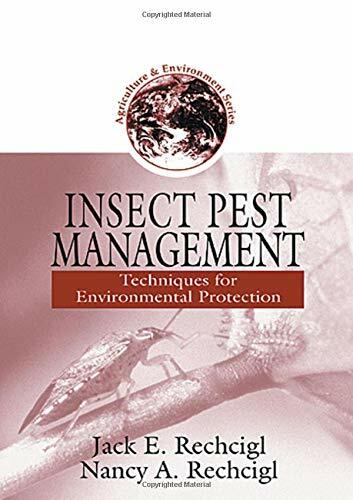 Insect Pest Management: Techniques for Environmental Protection (Agriculture & Environment Series) [Hardcover] Rechcigl, Jack E. and Rechcigl, Nancy A.
RECHCIGL, JACK E.; RECHCIGL, NANCY A.